I’m so glad that mail is delivered on Saturdays because today I received my It Works business builder kit! I’ve already started promoting my new business, but now I can really get things going! This is a package of 4 wraps that tone, tighten, and firm your skin. This is a full treatment and a $59 (loyal customer price) value! 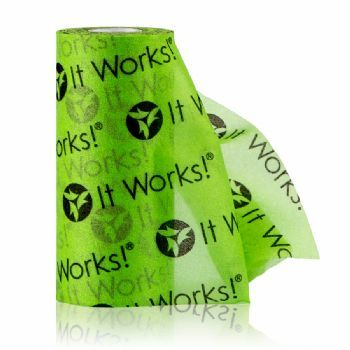 This product helps keep your skin wrap in place and is a $5 (loyal customer price) value! Here is an example of someone’s results using one of these wraps! Also inside the Business Builder Kit are catalogs, brochures, product information, Blitz Cards, and a silicone bracelet! I’m already starting to see results for myself after using these products (pictures and more info coming soon!) and I’m so excited to see what these products can do for others! Right now, I’m looking to add people to my team! Are you interested in trying a product like this for 90 days? Are you interested in using this as an extra income? Let me know if you want to be part of my team! Have you tried It Works?